Taking over as primary caregiver for an older relative can be challenging whether you live with them or not. Part of the problem is, that you can’t watch anyone every minute of the day. Moreover, regardless of whether this is a parent or even an older spouse you are caring for, there is such a thing as too much togetherness. Being able to maintain one’s independence and privacy goes along way towards preserving a person’s dignity. Fortunately, as we have blessedly moved beyond the days of out-houses and chamber pots, making your loves one’s bathroom needs doesn’t have to be a complete invasion of privacy. Naturally, the first few steps towards making the rest room a safer place are simple, and common sense. Do away with anything on the floor that might cause someone with stability problems to trip, like those bathroom rugs under the sink, next to the tub, and around the toilet. Especially if Mom or Dad is using a wheelchair or cane, these comfortable “trappings” may seem to make that tile warmed to the naked food, but they can easily cause a fall that breaks a bone or worse. Consider instead using non-slip flooring mats both inside the tub or shower, and outside the tub to catch the water and prevent slippage on the wet floor. Fuzzy slippers can be placed to the side within easy reach to warm those clean tootsies. Simply put, nobody uses all the soaps, creams, shampoos, etc. that lines their shower stalls and bathroom counters. They are a hazard to all who use these areas, because if you drop one, you will attempt to pick it up, and on a slippery floor, falling is a very real possibility. Couple this with any age-related physical limitations, and you are asking for trouble. Go through everything with your loved one, get rid of what you don’t need or use, and make sure that what is a necessity is placed in an easy to reach, safe place. You may also find it handy to install grab bars next to the toilet and inside the shower. This prevents seniors from reaching towards the towel bar in an emergency, which is not designed to withstand the weight of an adult body. The bars that you choose MUST be properly installed and mounted directly into the wall, providing solid support. Any of those temporary ones will just not be strong enough to be of any real use. The bars themselves should offer some sort of textured surface, making it easy on even the weakest of hands to get a grip. Besides being of use to the elderly, installing these bars into the walls of your bathroom will add to the overall safety of the room, because anyone can slip in the tub or on a wet floor. A step further would be to install a taller toilet at a “comfort height” to make it less of a struggle to get up and down. They also sell elevated toilet seats for a less permanent and expensive option. 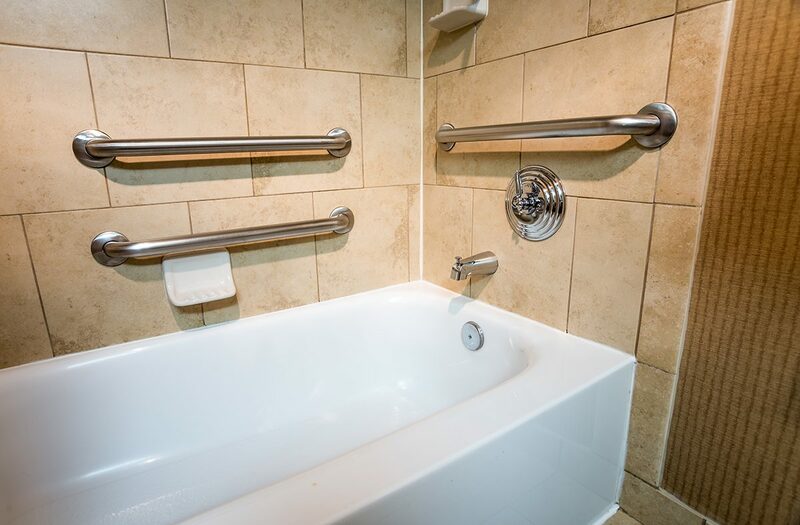 If Grandma loves to take long baths and she is not likely to overcome her latest infirmity, it may be time to go all out and install a walk-in-tub, shower bench, or both. Depending on the specific needs of the bather, it may be time to consider a walk-in or wheel-in shower design, with a “curb-less” entrance. Transfer or shower benches are designed to let the bather cleanse themselves while sitting comfortably on a surface that is calibrated to withstand their weight. Making sure you have a good detachable shower head is also important in this scenario. Technology has come a long way in the last twenty years in the advances on personal safety and home security- bathroom safety is no exception. Today’s medical alert technology allows a person to call for help without even having to touch a button, if they are unable to. Most now come with automatic fall detection buttons which are helpful in the shower – they will activate your life alert system to call the emergency response center. You can even get them connected to your home security system or voice control systems, such as Amazon’s Alexa or Google Home, which in addition to connecting a fallen senior to emergency services, can also be programmed to contact family members in the event of a mishap. Falls are the leading cause of injury-related deaths among older adults, according to the Home Safety Council. Even making a few of these changes can make every day living for seniors easier, safer and can prevent tragic accidents. Whether our loved ones live with us or not, we can’t be with them all the time, and with these steps we can insure that we don’t have to and still have peace of mind.